So, the League Cup is back again. How do you suppose Arsenal approaches this competition this year? I found myself wondering when was the last time a Premier League winning team had also won the League Cup trophy. I clearly must have blocked the awfulness out of my mind, because Chelsea did it in 2015. Manchester City won both in 2014 as well. Manchester United won both in 2009. Chelsea won both in 2005. Clearly, it happens often enough that the League Cup's reputation as a tournament that the top clubs don't care about is unwarranted. At the same time, if Arsenal were to win the League Cup and nothing more this season, we'd probably all still feel pretty empty. As usual with the League Cup, there are two main questions: how much rotation and how many youngsters? Gabriel has been in full training for over a week now as he returns from an ankle injury suffered in preseason. I would not be surprised if he finds his way back into the squad for this one. Could we see full scale changes to the back five? David Ospina, Mathieu Debuchy, Gabriel, Rob Holding, and Kieran Gibbs? Is that too much rotation? Aaron Ramsey is still short and might not be fit for this weekend either. Mohamed Elneny could get a start in the holding role; will Granit Xhaka for once? Or will there be some more youth involved in midfield instead? Jeff Reine-Adélaïde, anyone? It's hard to predict just what balance Wenger is going to want to strike between youth and experience. If you get the mix wrong, the team will perform sloppily and likely bow out. For example, last season's fourth round, when you combine that with two injuries on a poor pitch, you get a 3-0 loss to Sheffield Wednesday. Back in the summer of 2014, after his contract at Arsenal had run down, Nicklas Bendtner signed a three-year contract with Wolfsburg in the Bundesliga. He made 31 appearances for the Bundesliga club and scored three goals. This past April, the club terminated his contract with a year to go. So, here he is, the Greatest Striker Who Ever Lived(TM), with what looks like one last shot to resurrect his career. He's come off the bench twice so far and has not yet scored for Forest. I think the real questions are: just when does he score tonight and what weird sponsor does he have on his underwear that he will reveal when he rips off his shorts celebrating? Speaking of ex-Arsenal players scoring goals, Henri Lansbury had an 87th minute equalizer 10 days ago as Forest salvaged a point at Villa Park, so Bendtner isn't the only former Arsenal player involved in the Forest squad. Lansbury's been at the Championship club since 2012, when Arsenal sold him for a million pounds. Also, Forest have Armand Traoré, and that's just amusing. He moved to Forest from QPR this summer and has made two starts and three total appearances. As for the club's injury news, midfielder Matty Cash and striker Britt Assombalonga are both likely out. Defender Thomas Lam and midfielder David Vaughan are both doubts, while defender Damien Perquis faces a late fitness test with a groin problem. The Gunners have extended their unbeaten run to five matches across all competitions, dating back to the opening day loss to Liverpool. They've also won three straight in the league and climbed in the table to fourth after this most recent round of fixtures; recall, they were in 15th upon losing to Liverpool that opening Sunday. Of course, this is Arsenal we're talking about, so even a comprehensive 4-1 road win against Hull City is not without its discomforts. Don't lie, when Robert Snodgrass converted the penalty to make it 2-1, you all thought, "here we go again" before Alexis Sánchez restored the two goal lead. Then, Granit Xhaka scored a thunderbolt that made us all think, "hey, maybe this guy should be starting." Right? Right? Anyway, Nottingham Forest are 13th in the Championship after eight matches. They have not won since the last international break; they drew 2-2 at Aston Villa the weekend before last, drew 2-2 at Rotheram United in midweek, then lost 2-1 at home to Norwich this past Saturday. 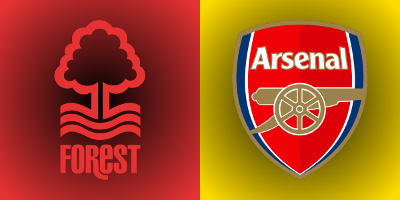 Arsenal have not played Forest since Forest's most recent relegation from the Premier League in 1999. The Gunners won 1-0 on their last trip to City Ground, on January 16, 1999. Martin Keown had the Arsenal goal in the 34th minute, scoring on a header from a corner. Arsenal and Forest have met twice in the League Cup, with Arsenal winning both ties by 2-0 scorelines. In January of 1987, Arsenal ran out 2-0 winners at Highbury in the fifth round. They went on to win a classic semifinal in a replay against Spurs before winning the final over Liverpool. Forest went on to win the League Cup themselves in 1989 and 1990. Arsenal lost the final in 1988; Forest lost the final in 1992. The sides met again in January of 1993, again in the fifth round. Again, Arsenal won 2-0 at Highbury, with Ian Wright scoring both goals. Again, Arsenal went on to win the title, this time beating Sheffield Wednesday for the first half of a domestic cup double. The referee is Lancashire-based Paul Tierney, the newest official in the Select Group. This will be Tierney's first Arsenal match. While this is his first season officially in the Select Group, he has been working the occasional Premier League match since his first on August 30, 2014. That was a 3-0 Swansea win over West Brom. That was the only top flight match he worked in 2014/15. He worked four Premier League matches last year and has only worked once so far this season. Tierney worked many games in the Championship last year and Nottingham Forest saw him on two occasions: a 1-1 draw with Ipswich Town in October and a 0-0 draw with Queens Park Rangers in January. John Painting is a contributing writer to the Modern Gooner and chess Olympian. You can follow him on Twitter @zorrocat to debate the merits of moves such as Bb4+.